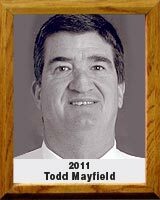 Todd Mayfield coached football and track and field at Sabino, Tucson and Palo Verde high schools for 33 years. Mayfield started his football coaching career as an assistant coach at Sabino (1977-82) and helped the team to its first win in school history. At Tucson High School, Mayfield coached from 1982-98 as the head coach with a record of 81-79-3 and earned coach of the year honors in 1986, then moved to Palo Verde for 12 years (1988-2010) and led the “We Believe” Titans to the state championship in 2005 with an 11-3 record. In 10 of 12 years at Palo Verde, his teams went to the playoffs and they earned region championships in 1998, 2006, 2008 and 2009. He was also named coach of the year in 2005. Mayfield played football, basketball and ran track at Sahuaro High School and played three years of football at Northern Arizona University. In 2010, Mayfield retired after 33 years as an educator in the Tucson Unified School District. Mayfield has volunteered his skills to the Big Brother Program of Flagstaff, Special Olympics, Catalina Foothills Little League and the Forest Service in Granby, Colorado. As an historian, Mayfield helped establish the histories at Tucson High School and Palo Verde High School.